busts of American leaders with the grinning heads of left-leaning pop-science personalities. 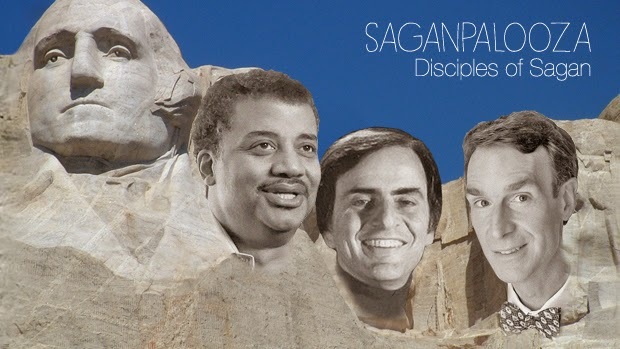 Disciples of Carl Sagan, indeed. It's important to note that the "disciples" cited in the above-linked blog are politically-motivated eco-alarmists...especially Michelle Thaller, Bill Nye and Neil Tyson. These latter-day spewers of scientific dogma have parroted their cherished Saganisms — vague cliches such as "all the grains of sand" and "primordial soup" and "nuclear winter" and "not a matter of IF but WHEN" — for decades, without even attempting to advance any fresh metaphor or rhetoric. The real difference between these "disciples" and their departed guru is that Carl Sagan actually was brilliant and original and able to effectively communicate complex astrophysical concepts to the general public; and Sagan did so without supercilious editorialism. This latest crop of Saganites, however, have significantly lowered the bar when it comes to science and education, siezing every opportunity to not only lecture their audience in kiddie-speak, but to impart their political sentiments above and beyond any actual scientific insights. The "disciples" and their zealous followers will protest: "That's the whole point of lowering the bar — so more DUMMIES can understand our stagnant scientific theories. That's how modern education works!" But, no, the point is that these "edutainment" personalities are not providing science educations so much as condescending political lectures. American education has been in a death spiral for more than 20 years thanks to lowered educational standards; and these pop-science personalities such as Thaller, Nye and Tyson aren't actually INSPIRING anyone, as did Carl Sagan. Rather, and deplorably, these modern talking heads spend more time spreading FEAR of asteroid impacts and super volcanoes and tsunamis and gamma ray bursts and anthropogenic global warming THEORIES than they do teaching scientific method. Because, surely, if they were teaching REAL science, they would warn their audience of the perils of fear-mongering THEORY.